The Ethiopian highlands are losing many valuable tree and shrub species because of anthropogenic and climatic factors. The coverage of high value indigenous tree and shrub species has declined. The tree species that used to provide quality products and ecosystem services have become limited. As a result, there is increasing use of non-forest/tree products such as dung and crop residues to fill fuel and other household requirements. This brief, co-produced by the Nile Basin Development Challenge and the Africa RISING research program on sustainable intensification, examines important issues to consider for the advancement of tree planting in the Ethopian highlands: germplasm issues, data and information-related issues, capacity development, working on a holistic and integrated approach, institutional issues and policy-related issues. Yet, trees can be a potential connector/integrator of the crop and livestock components of the farming system in the highlands of Ethiopia. The brief was developed from the third meeting of the National Platform for Land and Water Management – read the meeting report. 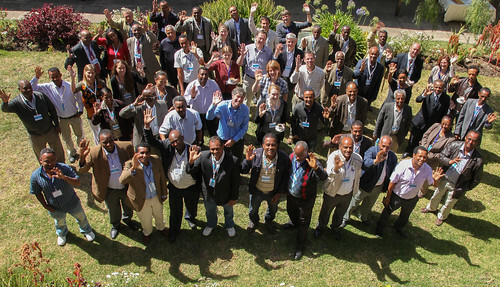 2013 is the final year for the Nile Basin Development Challenge (NBDC). On 20 and 21 February 2013, the NBDC convened a meeting of the National Land and Water Management Platform to review progress and directions for the coming phase. The workshop reflected on past work – approaches developed, research findings, key messages – in order to prioritize future interventions. Over 60 participants from partner organizations and other governmental, research and non-governmental institutions participated to the two-day workshop. After an introduction to the NBDC timeline, some key messages compiled by project staff were presented and discussed. A series of NBDC approaches, methods or areas of work were introduced later in the day: innovation platforms and recent insights, modeling, Wat-A-Game, Happy Strategies game, GIS, Goblet tool and suitability maps, participatory hydrological monitoring, digital stories and participatory video, and local planning processes. The participants formed groups to discuss the relevance of the messages they heard and to identify priority activities to build upon NBDC work and embed it in organizational and individual practices. 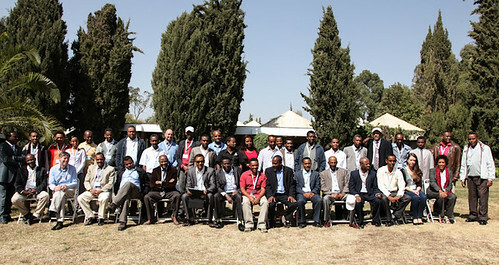 A special policy session also looked at possible contributions of the NBDC to priority development challnges in Ethiopia. At the end of the workshop, the Nile basin leaders Simon Langan and Alan Duncan reflected on the feedback received and the directions that the NBDC will take. Key directions include: repackaging research in accessible ways for farmers, policy-makers and other organizations; focusing on capacity development; finding practical ways to bring farmers’ and scientists’ voices together in crafting common approaches and discourse; addressing the regional gaps between local level work and national level engagement; and joining forces with existing initiatives that can reinforce the messages of the NBDC such as the Sustainable Land Management program. Read the notes of the meeting. Discover pictures from the event. One of the objectives of the Nile Basin Development Challenge – registered as one of the outcomes that the program hopes to achieves – is to develop the capacities of various actors, including of future generations of decision-makers, planners and implementers of land and water management policies and interventions. For the final year of the Nile BDC, a few more theses and pieces of work can be expected. Sabine Douxchamps, Augustine Ayantunde and Jennie Barron at the sister Volta Basin Development Challenge just published a study of agricultural water management in rainfed crop-livestock systems of the Volta Basin (Burkina Faso and Ghana) that investigates the return of aid investments on water availability, food security and livelihoods. When promoting AWM strategies, projects should carefully study the available information on factors triggering adoption, and play on these to ensure sustainable uptake of the technology. Local capacities and agendas should be better accounted for when promoting AWM strategies or low-cost irrigation technologies. Participatory management of the water infrastructure should be carefully planned through integration of maintenance costs in project budget, capacity building of actors towards assumption of more responsibility, and ways to deal with turnovers within management committees. Farmers’ capacity building is definitely a key asset for enlightened risk management and constant adaptation to new variable conditions. adoption and enhancing system productivity while maintaining healthy ecosystem services. There is a need for a system perspective, to improve water-crop-livestock interactions, to develop off-season cultivation options and market access, and to balance distribution of gender benefits. There is a need for a multi-scale, landscape perspective, to understand ecological landscape processes and trade-offs between ecosystem services derived from and affected by AWM strategies adoption across different scales. There is a need for an institutional perspective, to facilitate management of AWM structures and to raise awareness. Finally, there is a need for a long-term perspective, to foresee the best strategies for adaptation to climate change and manage risk in the variable environment of the Volta Basin. The topic working group on ‘spatial analysis and modelling’ (SAM) from the Challenge Program for Water and Food (CPWF) has agreed on a partnership between the International Water Management Institute (IWMI), Cornell University and Texas A&M University on a product dealing with global climate reanalysis data. This partnership and announced its intentions at the recent Soil and Water Technology (SWAT) 2012 conference. The product (available at this address: http://tamu-cornell.drfuka.org/) will be hosted by Texas A&M University for now. As an upcoming paper highlights, “Obtaining representative or near real-time meteorological data to force watershed models can be difficult and time consuming. Land based stations are often too far from the point of interest to adequately represent the weather, and many have gaps in the data series.” The Climate Forecast System Reanalysis (CFSR) global meteorological data set has the advantage of using precipitation and temperature data, which generally provide better predictions of watershed discharge than land based stations at distances greater than 10 km from the watershed center. This data set is useful for the SAM team for hydrological modeling, in the absence of gauge data. However, the data can also be used for any other application. It requires MET parameters – a lot of other parameters were not included (see full details at: http://rda.ucar.edu/pub/cfsr.html). Daniel Fuka, PhD student from Cornell University is leading this work.